Tanabata or the Star Festival, is celebrated on July 7th. This is based on the Chinese legend of a cowherder, Kengyu (the star Altair), and a weaving princess, Orihime (the star Vega), only being able to meet once a year on this day. Kengyu and Orihime are usually separated by the Milky Way and cannot meet each other. 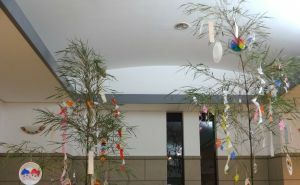 One popular Tanabata custom is to write people’s wishes on small, colorful strips of paper,and hang them on bamboo branches in the hope that their wishes will come true. You can see these branches in elementary schools, shopping arcades, and various significant public places. 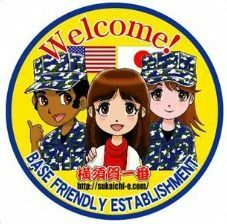 Writing materials can be found at the following shop. 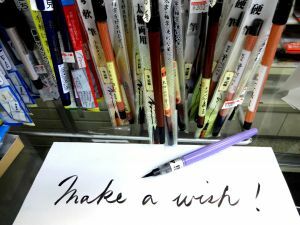 When you write your wishes, we recommend you write with a fude pen, which is a type of brush pen generally used for Japanese calligraphy. One of the wonderful features of this pen is that you can write many different kinds of lines just by applying different level of pressure on the pen. SHINAGAWA BUNKADO is located on Blue Street and has a wide variety of writing instruments.